EVERYTHING YOU EVER WANTED TO KNOW ABOUT ME (and, undoubtedly some things you didn’t). I was born in Southern Illinois to a philosophy professor and a kindergarten teacher desperate for a girl because they already had too many boys. I grew up out in the boonies surrounded by the silence of nature, my father’s handmade geodesic domes, and a house full of books. Growing up, I read everything I could get my hands on but always had a special love for science fiction and fantasy. When I was 13, my mother died of cancer, and it was this event that set me on a path to becoming a writer. I found great solace during those difficult years writing poetry and escaping into the wonderful world of words. Despite my early love of writing a books, I went on to college and got a degree in something completely different, something I could make a wage at and support myself with. Something it only took me five years to figure out I hated. By that time, I was living in Chicago, Illinois and was married to a wonderful therapist of Native American origin. We decided to make some children together. In quick succession we did, managing one of each gender, and I set about loving them while still scratching out occasional writings as time allowed. I continued to play with words when my family and I moved to Portland, Oregon and when my children both entered school full-time, I decided it was time to write full-time as well. My first short story, a science fiction tale titled “A Speck in the Universe,” was published in AlienSkin e-zine in 2005. It was quickly followed by more acceptances. Also in 2005, my husband decided we should all have an adventure by moving to New Zealand before America went to hell in a hand-basket, which not long after it appeared to be doing. While in New Zealand, I also founded SpecFicNZ, the national association for New Zealand writers of Speculative Fiction. In 2010 and 2011, while living in Christchurch, New Zealand, my family lived through the Canterbury earthquakes, (7.1, a 6.3 and over 7,000 aftershocks). In the process we lost one neighbor, two walls, two chimneys, one high school, three work buildings, a job, and our entire city. I now live and write happily from Portland, Oregon where things are less shaky but more rainy. My first novel, a YA paranormal thriller titled Ghost Hand, was released in November 2012. 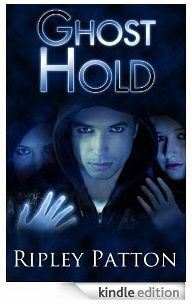 It is the first in a three book series and Ghost Hold (book 2) was released September 30th, 2013, with plans for book three of The PSS Chronicles to be released summer or fall 2014. I have also released my YA fantasy novella, Over the Rim, in e-book format. Themes that will always inform and permeate my work include, gender, female empowerment, death, magic, mysticism/spiritualism, and humor.